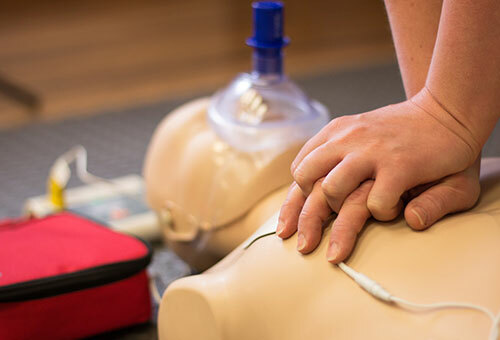 Previously known as Healthcare Provider Renewal, this course updates certified individuals in 1 and 2 rescuer CPR/AED for adult/child/infant, bag-mask techniques for adult/child/infant, rescue breathing for adult/child/infant, relief of choking for adult/child/infant, and introduction to CPR with an Advanced Airway. Upon completion, students are emailed an American Heart Association BLS Provider CPR e-Card with two-year certification. Must have current BLS Provider CPR certification to enroll in this course. Electronic AHA eCards will be emailed upon successful completion of the course AND payment of all fees. Textbook should be read prior to the first day of class. The book may be purchased at the Chilton Regional Center or FVTC Bookstore located at entrance 10 of Fox Valley Technical College, Appleton Campus located at 1825 N Bluemound Road or online at www.fvtc.bncollege.com. Purchase your textbook from the Appleton Campus Bookstore, 1825 N Bluemound Road, entrance 10, or online at www.fvtc.bncollege.com. Please read the textbook prior to class and the book can be used on the written test. Please contact the Clintonville Regional Center at 715-823-1555 if you have questions. Class will be held at FVTC New London Adult Education and Family Learning Center. 110 W North Water Street, New London WI 54961. If you have any questions on this class, please contact the Clintonville Regional Center at 715-823-1555. A textbook manual is required for the class in which you are enrolled. It may be purchased at the FVTC Bookstore located in the Fox Valley Technical College Riverside Campus located at 150 North Campbell Road in Oshkosh. No textbooks will be sold at class. The textbook required is called AHA BLS Provider Manual 2015 with an ISBN # 9781616694074 published by the American Heart Association. A textbook manual is required for the class in which you are enrolled. It may be purchased at the FVTC Bookstore located at Entrance 10 of Fox Valley Technical College Appleton Campus located at 1825 N Bluemound Road or online at www.fvtc.bncollege.com. No textbooks will be sold at class. Textbooks should be purchased at the Appleton Campus Book Store, entrance 10 or by going on line to www.fvtc.edu/bookstore.